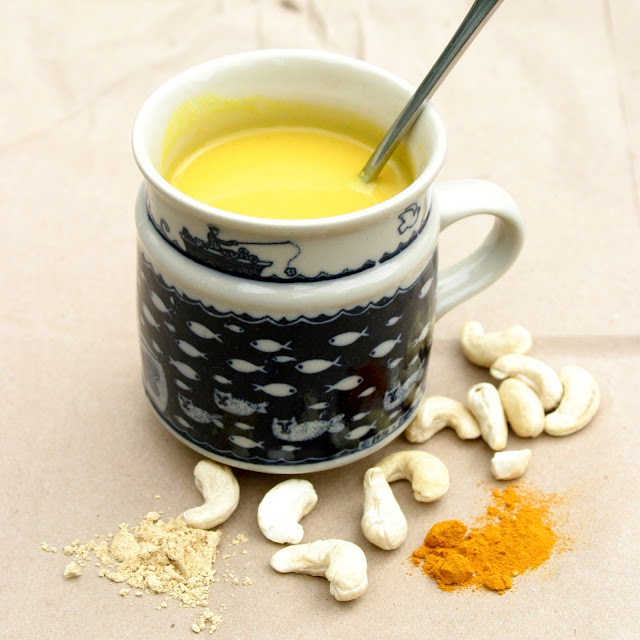 Many years ago I wrote a blog post about making nut milk. 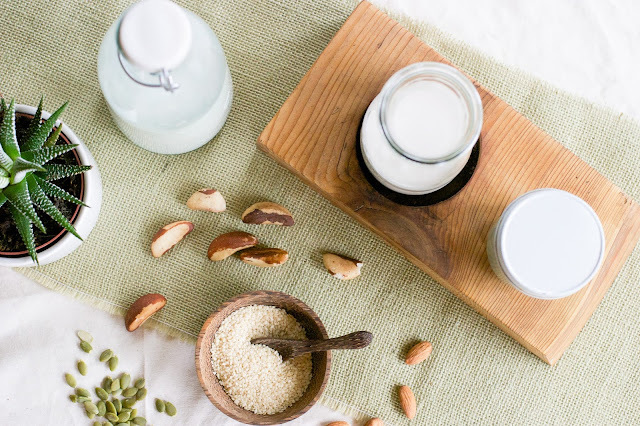 So now I think it’s high time for a nut milk makeover…not only to boost your health but also to help keep your wallets full! Plus, I love to give a friendly reminder every now and then that nut milk should be made at home instead purchased at the store. The only tools you need to make creamy, rich, and smooth nut milk is a high speed blender and a fine mesh nylon nut milk bag. Its soooo simple to make and the quality and cost far outweighs what you can buy at the store. 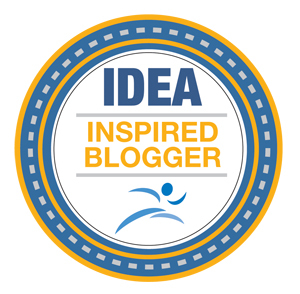 I know I might be preaching to the choir, but there is no shame in repeating it---because we all get lazy. No more boxed almond milk that contains extra fillers, sugar, and is watery in flavor. And yes, you can buy a 12oz bottle of raw cashew nut milk for $8 at Whole Foods. But really, why spend so much on so little, when you can make an even BETTER nut milk at home for pennies on the dime? Where is your money going?? Boxed Nut Milk: These nut milks contain ~ 5-6 almonds per cup of nut milk. That is why they are low in calories, generally 30-40kcal per cup. However, they lack creaminess, richness, and nutritional density, making them a poor substitute for creamy whole fat milk. Plus they usually have added stabilizers, cane sugar, and generally do not use soaked and sprouted nuts. 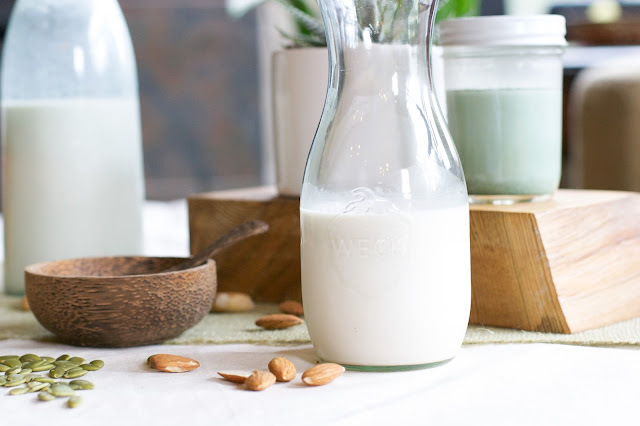 Store Bought Raw Nut Milk: Although the ingredients and quality is far superior then boxed nut milks, and they taste creamy and rich, they generally cost an arm and a leg. I have only come across Raw Cashew Nut Milk at Whole Foods which costs ~ $8 for a 12 or 16oz bottle. Plus, it doesn't contain nearly the nutritional diversity as homemade MINERAL RICH nut milk. Homemade Raw Nut Milk: Using ~1 cup of nuts to 4 cups of water, makes this beverage creamy, rich, and satisfying just like a glass of whole milk (if you like to drink whole milk by the glass that is). It also contains higher quality ingredients. You are 100% in control. You can choose to add a healthy sweetener (date, maple syrup, honey), add spice, or decide whether you want to purchase organic or conventional nuts and seeds. The price? For organic, raw, sprouted, and of course homemade MINERAL RICH nut milk, I spent about $2.50 for a 32oz serving. Now, who can beat the price and the quality of homemade nut milk? So my new version of nut milk, is not just any nut milk. 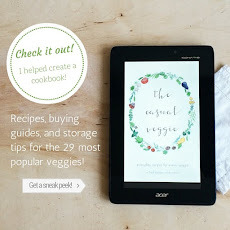 Most recipes you see on the web are for almond milk, cashew milk, sunflower milk, etc. Yeah they are great, but why not mix it up a bit? Each nut and seed has unique nutritional benefits. 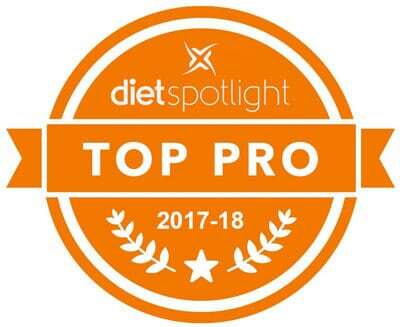 Almonds are rich in vitamin E, Brazil nuts are rich in selenium, pumpkin seeds are rich in magnesium and zinc, sesame seeds are rich in calcium, and on and on it goes. Why stick with just the same old almond or cashew? 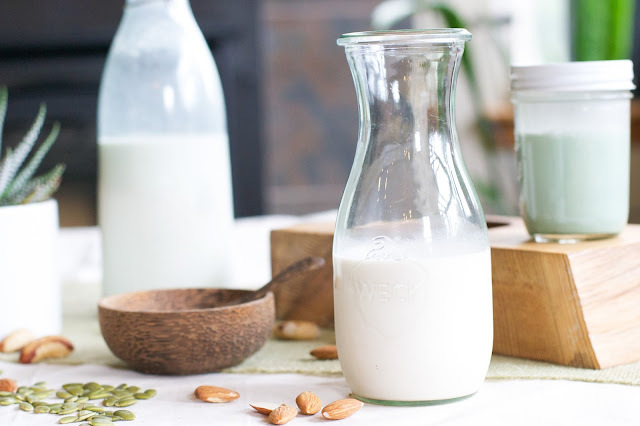 Why not make a super rich and creamy nut milk that is full of a variety of nuts and seeds?? That is why I have created a very tasty and very MINERAL RICH nut milk. You wont find this anywhere, grocery stores will not even carry a boxed version of this. 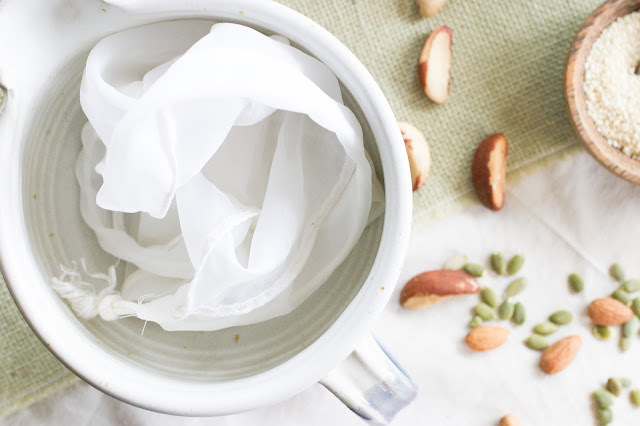 So get out your blenders, purchase a nylon nut milk bag (it makes all the difference, trust me) and pick up some nut and seeds so you have a nutrient rich, plant based milk to add to your coffee, oatmeal, or green smoothie tomorrow morning! No more slacking, its time for a nut milk revolution!! These nuts are pretty amazing because just one nut meets over 100% of your daily selenium needs. What is selenium? It is a trace mineral that along with iodine, and zinc plays a very important role in healthy thyroid function and helps reduce oxidative stress within the body. A diet low in selenium can thus have far reaching effects on metabolism, energy, and ability to combat free radicals. However, as with everything too much can be harmful to our bodies as well. Since Brazil nuts are the most concentrated source of selenium, limiting yourself to 1-2 per day is all you need. If you haven’t incorporated pumpkin seeds into your life, you should start now. These tasty seeds are super rich in minerals zinc and magnesium, both of which are very important for optimal health. Interestingly, many people tend to be deficient in magnesium, either due to poor intake of whole grains, nuts and seeds, or also because the soil is becoming more depleted of this mineral. Either way focusing on getting more magnesium into your diet can have far reaching positive effects. Magnesium can help reduce headaches, reduce cramping, increase overall energy, control blood sugar, and just generally help reduce inflammation. What more do you want? These common household nuts are a great source of vitamin E, a powerful fat soluble antioxidant. Naturally, ¼ cup of raw almonds contains 40% of your daily vitamin E. Food for thought. 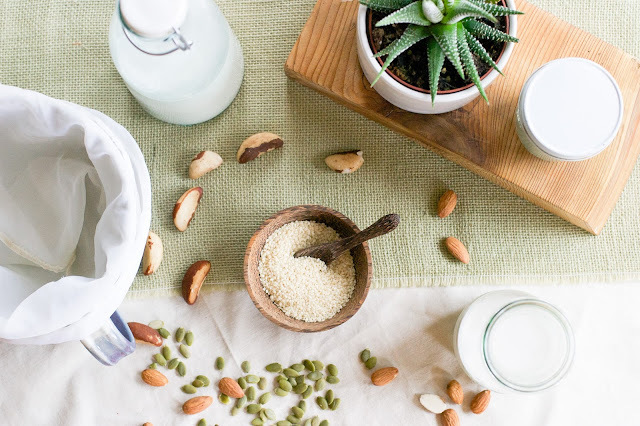 If boxed nut milks actually contained enough almonds per serving, the manufacturer would not have to fortify milk with added synthetic vitamin E.
These tiny little seeds are an especially good source of plant based calcium and copper. They are also contain magnesium, although not nearly as much as pumpkin seeds. We all know that calcium is important for bone health. However, what about copper? 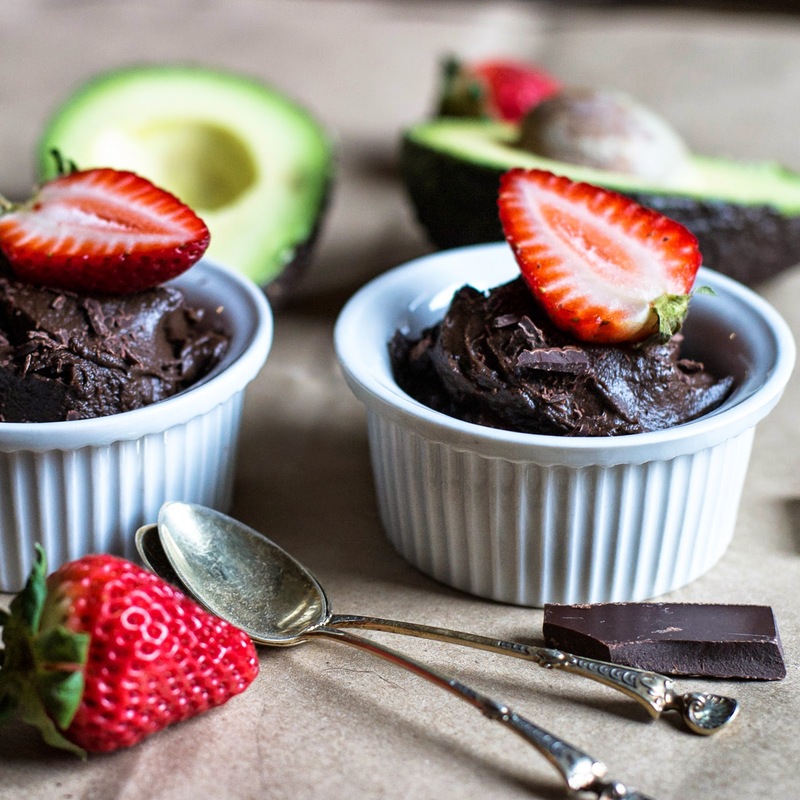 Copper is needed to help our mitochondria produce energy (ATP) and to support healthy connective tissue formation, in the skin, heart, vessels, and bones. Wow! 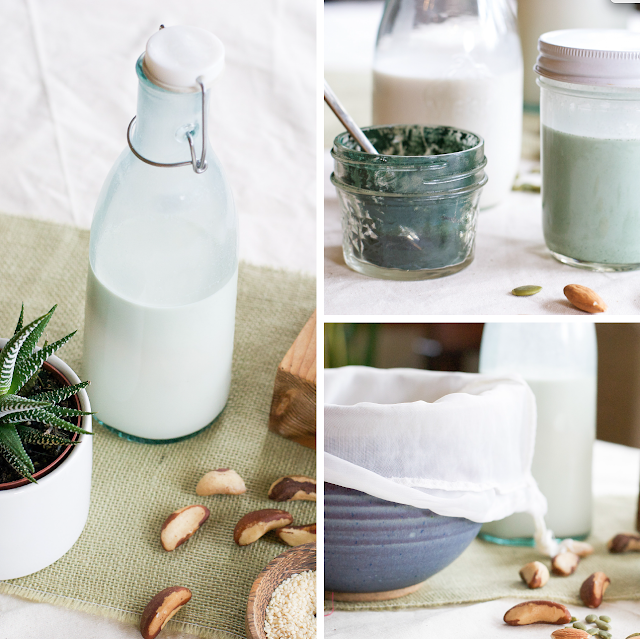 Isn’t that a lot of goodness in one simple nut milk recipe?? Plus if you want to kick it up a notch…1/4 teaspoon of spirulina mixed with 1 cup of nut milk, is super tasty and gives you an extra nutritional boost. 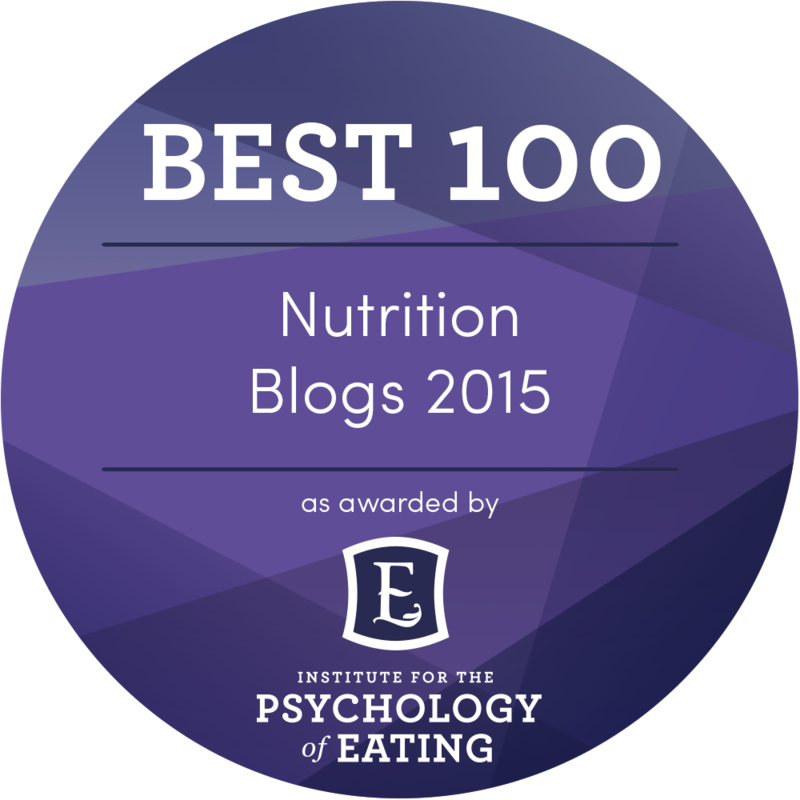 Read more about spirulina and its' benefits here, here, and here! So, get creative, make your own blend of nut milk joy. 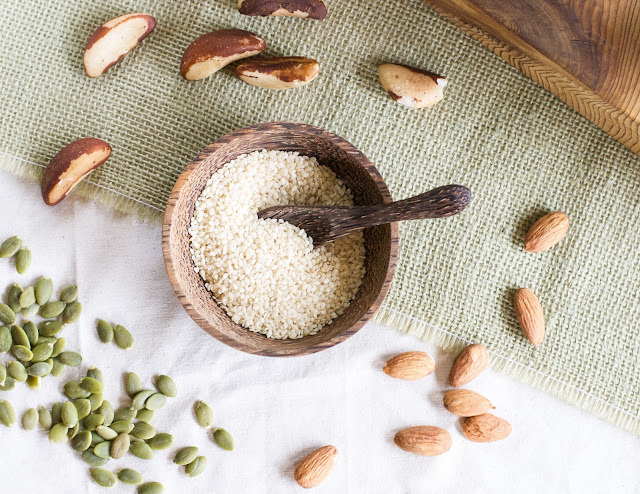 Swap the almonds for cashews or hazlenuts, the sesame seeds for hemp or flaxseeds, or add some vanilla for extra flavor. Either way, mixing it up, is the best. Out with the old, in with the MINERAL RICH! Place the nuts and seeds into a bowl and cover with warm water. Allow the nuts to soak 4 hours or overnight. Strain and rinse the nuts and seeds and put them into the blender. Add 4 cups water, the pinch of salt, and the optional 1-2 tablespoons maple syrup. Blend on high for 45-60 seconds. 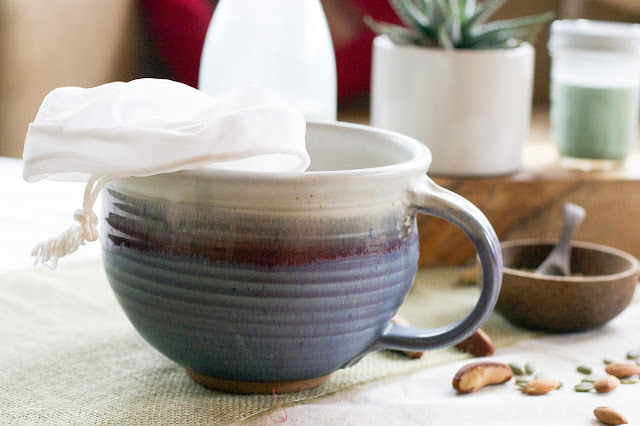 Line a bowl with the nut milk bag and pour the nut milk into the bag. Squeeze out the milk, leaving behind the nut pulp and fibers. Save this pulp to add to baked goods, to make crackers, or simply compost. Store the strained nut milk in a glass container for a week in the refrigerator. Note: If you want to make Mineral Rich SPIRULINA Nut Milk then add 1/4 teaspoon per cup of nut milk.